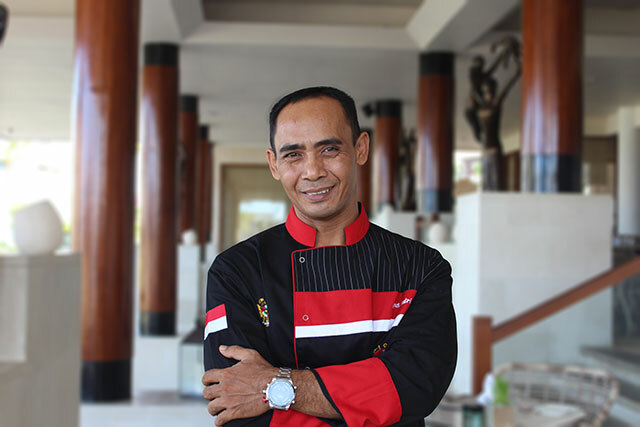 Nusa Dua, 20 June 2016 After a year absence in the kitchen of Samabe, Bagus Satria Wijaya is named as the new Executive Chef in Samabe Bali Suites & Villas, a ritzy resort in Bali. Bagus brings his 22 years of culinary background to lead the kitchen team at this Bali luxury resort in delivering impressive gastronomical experiences to the customers. Prior to his tenure at Samabe Bali Suites & Villas, he worked in top notch hotels in Indonesia such as Amatera, Mulia Bali, Amanusa, and more. He will debut his menu in August. The new menu will focus on introducing the authentic savor of Indonesia with an exemplary presentation, such as Nasi Bakar Majapahit (Grilled Rice Majapahit). This street food offers the savor of Indonesian spices such as coriander, nutmeg, and cinnamon in banana-leaf-wrapped rice. "The robust Indonesian cuisine should be proudly introduced to the world, and I'll start it in Samabe. Indonesian spices will be perfectly mixed in the food and later, it will be a unique taste not to miss here" he said. "The return of Bagus to the team will bring a positive impact to the team. I trust him to bring a distinct characteristic to the dining table aligning with our standards as a luxury resort", said Ralf Luthe, the General Manager of the resort. Samba Bali Suites & Villas is a five-star resort located atop the cliff of Nusa Dua, the southern part of Bali. It sits on an 8-hectare area with 81 suites & villas. It offers Unlimited Privilege or all inclusive package consisting 24-hour butler service, unlimited food and beverage, and Samabe signature activities.